The A Train.... a Brighton Train That Really Moves! You would hardly notice it was there. But open an unassuming door in a quiet residential street in Brighton’s Seven Dials and you are welcomed back in time to experience the music and dance of a bygone era. 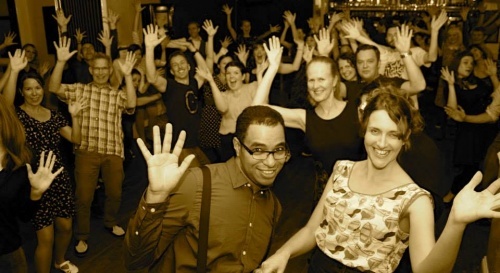 Every Tuesday, the Railway Club in Belmont, just north of 7 Dials …hosts a swing dance night called The A Train, offering lessons for absolute beginners in Lindy Hop, a style of swing dance that first became popular in the 1930s. Learn a few basic moves and you’ll be dancing the night away to the most swinging tracks from the big band era, played by a resident DJ. Maybe it’s the syncopated rhythms of the music, from the likes of Count Basie, Glenn Miller and Duke Ellington, maybe it’s the enthusiastic encouragement of the dance teachers, or perhaps it’s just the really cheap bar, but everyone seems to be smiling. 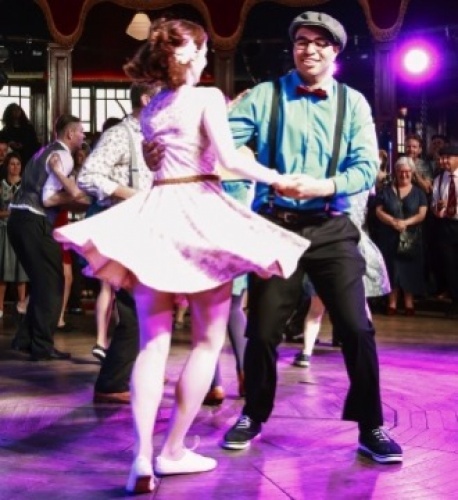 The night’s organisers, Brighton Lindyhoppers, have been teaching people to swing dance for the past seven years and specialise in making everyone feel comfortable, even those who think they have two left feet. ‘For me, the most important thing about our classes is the way it makes people feel,’ says Brighton Lindyhoppers’ co-founder Amanda Walderman. ‘Lindy Hop is a real community, everyone is welcome and anyone can do it. It’s been amazing to see how our students’ dancing has improved over the years, but it’s been even better to see how happy it has made them and how many new friends they have made. We run classes across the city but The A Train is the night when the swing dance community gets together, shares a drink and a laugh and puts into practice all those moves they have learned.’ Brighton Lindyhoppers were even recognised for the joy they create in their classes when they were included in this year’s Brighton happy list. So, if you fancy learning a new skill, getting fit and putting a smile on your face in 2018, get on board the A Train. Classes at Brighton Railway club, 4 Belmont, BN1 3TF start at 7.30pm, with the music playing until 10.30pm. Entrance is £7, you don’t need a partner and there is no need to book in advance. You don’t need any special clothes – all you need to bring is some flat shoes and a sense of fun. For more details about Brighton Lindyhoppers, see www.brightonlindyhoppers.co.uk or find them on Facebook and Twitter.